The most successful bodybuilders vary in ethnicity, background, and financial backing; but they all share the same respect for bodybuilding. As many of you know, Olympia winner Ronnie Coleman was not born with genetic inclinations to put on muscle mass easily. However, by acknowledging the mechanisms of bodybuilding and adopting the mental ethics for success; Ronnie surpassed countless genetically inclined bodybuilders. We understand that you may or may not want to reach the extreme mass of Mr. Coleman, but the ethics that brought him success are the same ethics that are required for you to reach your destination and stay there. Just because someone goes to the gym and works out thinking: “it would be nice to have a strong one-in-a-million body” does not mean they are bodybuilding. In fact, if that is your strategy then you are leaving over 75% of your gains to chance. In order to body build, you need to acknowledge all the physical requirements of building your body; while not allowing deviant mental inclinations to lead you astray or rationalize slacking. Ethics In The Gym: If You’re Under Training, Train Harder; If You Think You’re Over Training, Train Harder. Clear your mind and let us ask you this question: what is the difference between giving up early… or choosing to ‘save energy’ for your next exercise? No difference. Plain and simple, these two choices achieve the same failure. 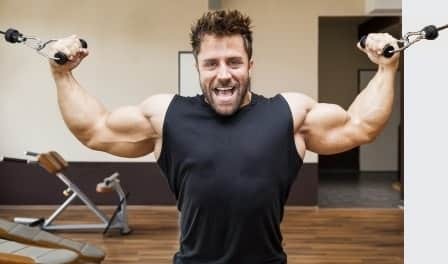 Far too often, guys stray from the absolute law of building muscle (LIFTING HEAVY), by giving in to the weak minded rationalization that hitting every arm machine in the gym will make them build muscle faster. This couldn’t be more toxic to your gains, because you believe the lie which was fabricated as an easy way out. Let us reiterate the absolute law of building muscle: to build muscle you must lift heavy. That means you need to max out; and if you are pulling off a full circuit of 12+ arm exercises on arm day with 3 sets of reps each, then buddy you are not maxing out… You are under training in excess. To build the most muscle in the gym, performance is everything. You need to maximize the amount of weight you lift, while focusing on exceptional form. 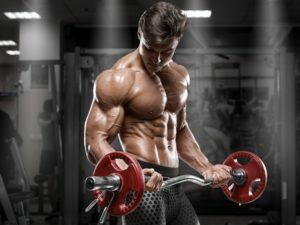 If you put these two rules above all else, you will obtain the maximum amount of muscle growth obtainable from this component of the bodybuilding picture. In light review, of course you are not maxing out with your first set. The accepted practice of working your way up to your last set or two pushing your max is the way to go (unless you are following a specific proven workout cycle or in a cutting phase). One of the many golden mottos said by Arnold Schwarzenegger goes something like this: “Building muscle and bodybuilding is all about your ability to tolerate pain”. Now, we’re sure that Arnold wasn’t referring to knives and daggers; but we are quite confident that he was referring to the pain-like challenge of summoning all the strength within your being to push through a rep that you were not able to finish yesterday. Truth be told, not everybody has the ability to do this; mind over matter is some deep shat. Alongside maxing out like a beast among men, trying different workout routines will keep you earning 100% possible gains. That doesn’t mean jump on every fad that makes it to TV or the skinny chump at GNC preaches; nah, we mean the workouts that you look over and think: “this isn’t going to be easy”. After all, when you put hard work in – hard muscle comes out. 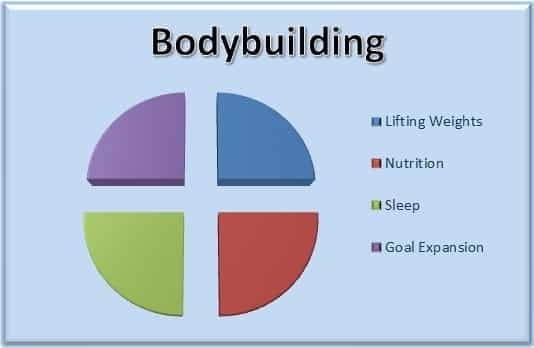 Together, proper nutrition and sleep easily account for 50% of successful bodybuilding. Just like the principle of hard work in equals hard muscle out – excessive damage must be balanced with nutritional components and reparative sleep conditions. We’re not going to preach exactly what to eat, but we will reinforce the facts that as a bodybuilder you must prioritize superior nutrition with greater variety and emphasize protein. 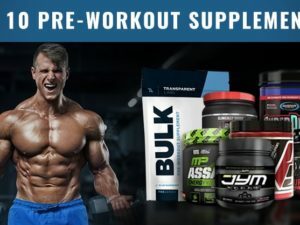 Whether or not you want to take workout supplements is completely your call, which we discuss in many other articles on this website. However you cannot deny that unless you have excess ‘matter’ from food you cannot build ‘matter’ as muscle. A deficit of food and protein is often the cause of over training symptoms in a realistic workout regimen. Accept and embrace it. Proper sleep accounts for atleast 25% of muscle growth, not to mention all of the other benefits. As a bodybuilder, the ideal amount of sleep is 8-10 hours a night. Professional bodybuilders are known to sleep up to 13 hours a night for maximum muscle growth. While you sleep, all sorts of bodily maintenance functions turn on. 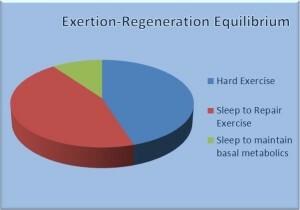 These functions cannot work while you are awake because of the chaotic environment inside your body during activity. Therefore, when you sleep 8+ hours a night, your body is able to regenerate your bodies basal needs and bodybuilding needs. The most recognized influence of a proper sleep schedule is hormonal balance. In contrast, when you do not receive enough sleep: your body struggles to maintain basal needs, stress hormones rise, muscle building testosterone levels fall, and you not only feel but you look like crap. As a bodybuilder, understanding the multiple factors that attribute to muscle growth is a secret weapon. 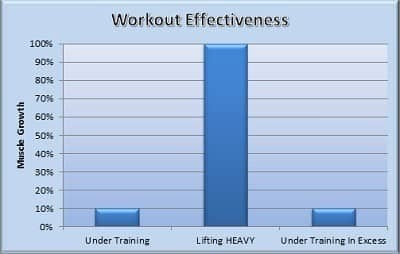 Even if you only meet 80% of all four categories: Lifting, Nutrition, Sleep, Goal Expansion; you will still build much more muscle than someone lifting 100% but failing to recognize the other factors. If you are currently stuck in a plateau, we urge you to stay focused, and add more sleep to your schedule. Almost every time, that plateau will be broken gloriously.